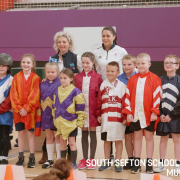 On Tuesday April 2nd, Racing to School’s Education Officer and former Grand National jockey Carrie Ford, joined Olympic Gold Medallist and Aintree Racecourse Ambassador Sam Queck, on the 2019 Randox Health Grand National Trophy Tour. The tour gave school pupils from across Liverpool an exclusive sneak-preview of the new Grand National trophy. The tour started at King’s Leadership Academy, where Year 7 pupils, as well as those from 10 local primary schools, got to hear from Sam about her experience winning a gold medal in the ladies hockey at Rio 2016. Carrie was able to wow the group with her thrilling experiences when finishing fifth on Forest Gunner in the 2005 Grand National. 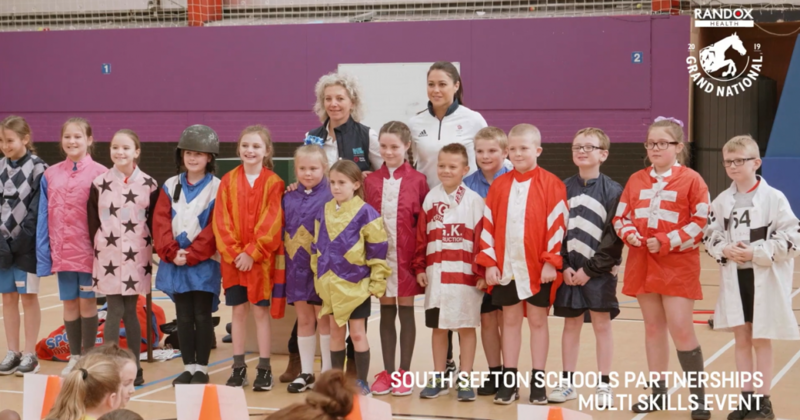 The tour moved on to Maricourt Catholic High School, the closest school to the racecourse and our partner in the Aintree Beacon Programme, which aims to engage schools in racing areas with a bespoke programme of learning activity. The final leg of the tour took these two pioneering sportswomen to the Oncology ward at Alder Hey hospital, where they got to meet and chat to the amazingly brave patients and their parents. The magic of the Grand National is something for everyone to enjoy.